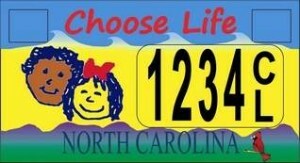 WASHINGTON — A prominent Christian legal organization has petitioned the United States Supreme Court to affirm the right of North Carolina officials to issue ‘Choose Life’ license plates to residents who wish to purchase them. Alliance Defending Freedom (ADF) filed an appeal with the court on Friday on behalf of Thom Tillis, speaker of the North Carolina House of Representatives, and Phil Berger, president pro tempore of the North Carolina Senate. As previously reported, in February, a three-judge panel with the 4th U.S. Circuit Court of Appeals unanimously upheld a federal judge’s ruling that declared the “Choose Life” license plate unconstitutional. U.S. District Court Judge James Carroll Fox had opined in December that the plates amounted to viewpoint discrimination because the state did not also issue plates favoring abortion. In releasing his ruling, Fox sided with the ACLU of North Carolina, which had sued the state on behalf of residents who thought it unfair that the legislature would not also allow the issuance of customized pro-abortion plates. As the state attorney general declined to appeal the 4th Circuit decision to the Supreme Court, Tillis and Berger requested to represent the state instead. The appeals court obliged.